Goon Squad: Is David Cameron Getting Punished by Jew Inc? I disagree. Cameron is a zionist through and through and has jewish roots. When he took the vote to Parliament in 2013 about attacking Syria he truly thought he would win. British people dissented. They blogged and contacted their MPS TO SAY NO MORE WAR. King David Cameron was devastated with the result. At the time he assured the British people there wouldn't be another vote, but there was and now like American tax-payers, British people are paying to kill people again. Cameron announced in the last election he would not serve the full term as Prime Minister. The jews are getting ready for George (real name Gideon) Osborne or the another crypto jew Boris Johnson to take his place. Cameron's photo adorned the Conservative Friends of Israel website for years with the Israeli flag. Cameron told the Jewish Chronicle "My values are your values"
excellent post! 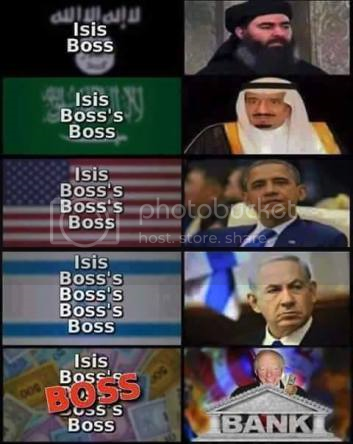 Love the ISIS "boss" image...in a nutshell! Just because Cameron is a member of Jew Inc doesn't mean he won't get his fingers spanked for not bombing Syria. Release his name and dirty his rep, and the rest of their GOY flunkies will be even more obedient, hoping to keep their name out of the papers and their hidden assets.